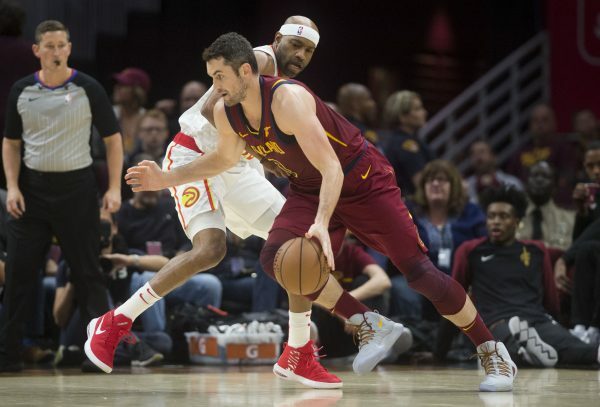 Cleveland Cavaliers power forward Kevin Love has been unable to play for over two months following toe surgery, with his scoring and rebounding ability sorely missed by the struggling Cavs. However, there appears to be some chance that Love could return to the court during the Cavaliers’ upcoming Western Conference road trip. Love underwent toe surgery on Nov. 2 after weeks of struggling with a nagging issue that apparently developed during training camp. He played in four regular season games, averaging 19.0 points and 13.5 rebounds per game, but was clearly having issues with his shooting from the field. His overall field goal percentage stood at just 32.3 percent and his 3-point shooting was even worse at 29.2 percent, numbers far lower than his career numbers of 44.3 and 37.0, respectively. During his time with the Cavaliers, Love has had problems staying healthy, an issue that was also evident during his time as a member of the Minnesota Timberwolves. With the Cavs, Love has had such things as a separated shoulder, knee surgery and a hand fracture. In addition, last season, he went public with his battle with panic attacks and has also had to twice follow concussion protocol during the postseason. However, his insertion back into the lineup figures to be a positive development for a Cavaliers team that currently has an 8-29 record on the year. That Western Conference road trip gets underway on Jan. 9, with six games played over an 11-day span. The third game of that trip will involve the first time the Cavaliers face their former superstar, LeBron James, in his new home at Staples Center. James signed as a free against with the Los Angeles Lakers in July.